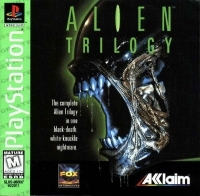 Description: The complete Alien Trilogy in one black-death white knuckle nightmare. They're back!!! Face huggers chest bursters dog aliens adult aliens ruthless corporate shills and locate and eliminate the queen! This is a list of VGCollect users who have Alien Trilogy - Greatest Hits in their Collection. This is a list of VGCollect users who have Alien Trilogy - Greatest Hits in their Sell List. This is a list of VGCollect users who have Alien Trilogy - Greatest Hits in their Wish List.